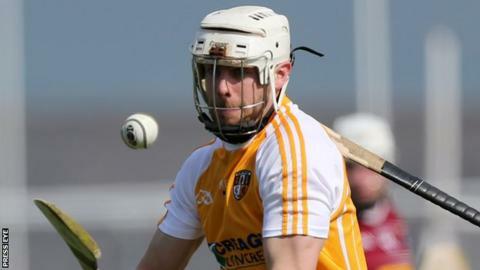 Antrim's hopes of Hurling League promotion have suffered a blow after star forward Neil McManus sustained a broken cheekbone which is likely to rule him out for at least three games. Cushendall's McManus picked up the injury in Antrim's game against Tipperary on 29 January. "I'm definitely going to miss two or three games," said McManus at the Allianz Hurling League launch. The Saffrons open their Division 2A campaign against London on Sunday. McManus also expects to be ruled out of Antrim's second match away to Carlow on 19 February and is not hopeful about playing in the contest against Kildare at Ballycastle on 5 March. It's Antrim's second successive season in the division after their attempt to regain Division One status imploded last Spring during a campaign which saw PJ O'Mullan's brief managerial reign come to an end. Managerial quartet Terence McNaughton, Dominic McKinley, Gary O'Kane and Neal Peden have opted to have a league debut to St Paul's defender Stephen Rooney but the Saffrons will parade a predominantly experienced line-up. The side includes skipper Simon McCrory, Paul Shiels, Conor McCann, Ciaran Johnston, Ciaran Clarke and Odhran McFadden. Despite his own misfortune, McManus believes that the Ulster champions are capable of producing a strong promotion challenge. "From the get-go, that's what we are going to be interested in," McManus told BBC Sport Northern Ireland. "It is going to be extremely competitive and we will not be the only county eyeing promotion. "We are probably not even promotion favourites but we believe we are capable of putting a serious challenge in place. "I know we have the hurlers to do it. More importantly the desire is there. People have committed and people are starting to buy into what it is to be an Antrim hurler and what a privilege that is." Antrim went into last season's Division Two A campaign as favourites but after winning their two opening games against Derry and Kildare, the Saffrons lost their last three encounters with Westmeath, Carlow and London. The Ulster champions will conclude their Division Two A fixtures with games against Armagh and Westmeath. Antrim: C O'Connell; S Rooney, J Dillon, Ciaran Johnston; S McCrory, O McFadden, C McKinley; E Campbell, D McKernan; P McGill, C McCann, N McKenna; C Clarke, P Shiels, Conor Johnston. Subs: R Elliott, N McAuley, M Donnelly, D Murphy, R Diamond, T Coyle, M Connolly, J Maskey, C Carson, P Burke, J McNaughton.